With a new month, comes a new space to organize in the Organize and Refine Your Home Challenge. 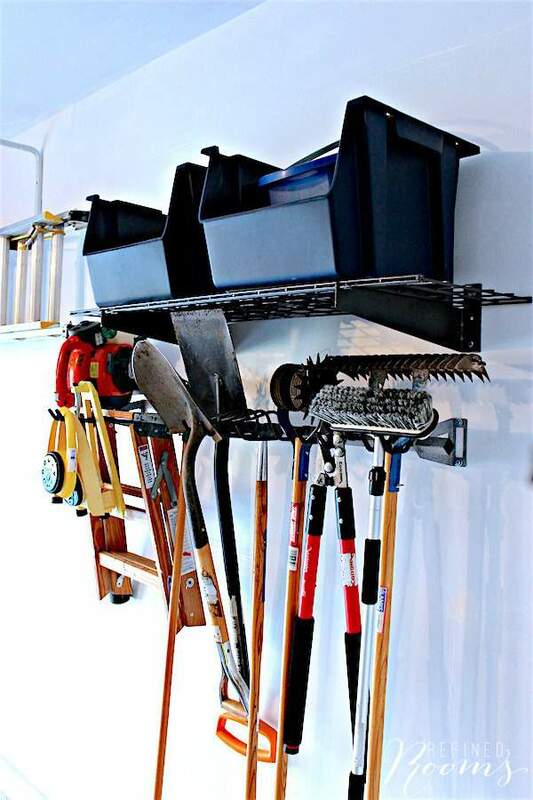 This is a great time to turn our attention to organizing outdoor spaces, and so we’ll be getting our hands dirty during our garage organization project this month! Just to give you a heads up, I decided to structure the Challenge a bit differently for May. 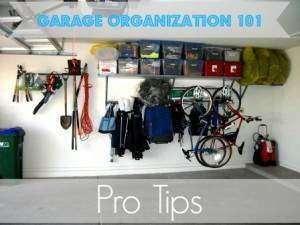 Instead of breaking down the organizing assignments across multiple posts during the month (like I’ve done in previous months), I’m giving you the entire list of assignments associated with garage organization up front. 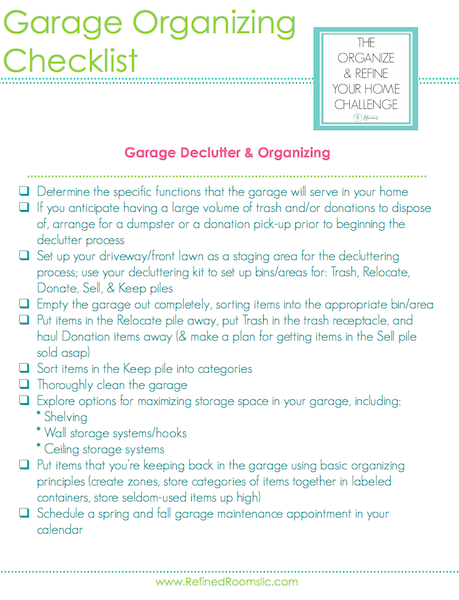 Unlike other organizing projects that we’ve tackled in the Challenge this year (laying the foundation, home office, closets, and the kitchen), it’s much more difficult to spread out a garage declutter/organizing project over the course of a month. I know it sounds daunting, but I highly recommend that you set aside a few days (depending on the size of your garage and magnitude of clutter) to tackle the entire garage declutter/organization project in one fell swoop. Once you start hauling all of your belongings out onto the driveway and/or lawn, you’re not going to feel inclined to want to leave your stuff out there for weeks on end as you slowly work through the organization process. This is a “rip the bandaid off” kinda organization project! Ugh, I have to admit that this is my least favorite space to organize. It often involves dirt, critters and bugs, and lots of tools and “man things” that frankly just aren’t my thang. My Hubby takes care of most of the yard work and outdoor maintenance at Chez Gallagher, so in my house, the garage really is his domain. BUT…a few times a year, he gives me free reign to tweak things here and there, so that I don’t cringe when I pull the car in each day. So, like you, I’m pushing up my sleeves and getting ready to whip the garage back into shape this month! 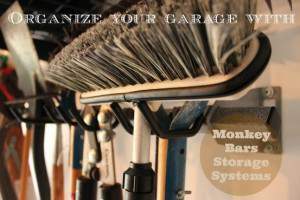 As you’re probably well aware, the garage is a common organizing “hot spot”, because it often serves as a dumping ground for miscellaneous stuff that hasn’t been assigned an official place to live in our homes. So the first task this month is to put on your “be intentional” hat, and write down all of the specific ways you want your garage to serve you. The original purpose of the garage is to protect one of our most valuable assets…our cars. It’s amazing how many people are unable to park their cars in the garage because the space has been gobbled up by household clutter. If one of the functions you’d like your garage to serve is to protect your cars, write it down! Deciding on these categories up front makes it easy to figure out what gets sorted into that Relocate pile when it’s time to sort. When planning your project, you’ll obviously want to schedule your decluttering sessions during fair weather (no rain, not too hot). Set up your driveway as a staging area for the sorting process, designating areas for the following categories: Keep, Donate, Sell, Trash, Relocate. Make sure you’ve got your decluttering kit and your cleaning supplies on hand. 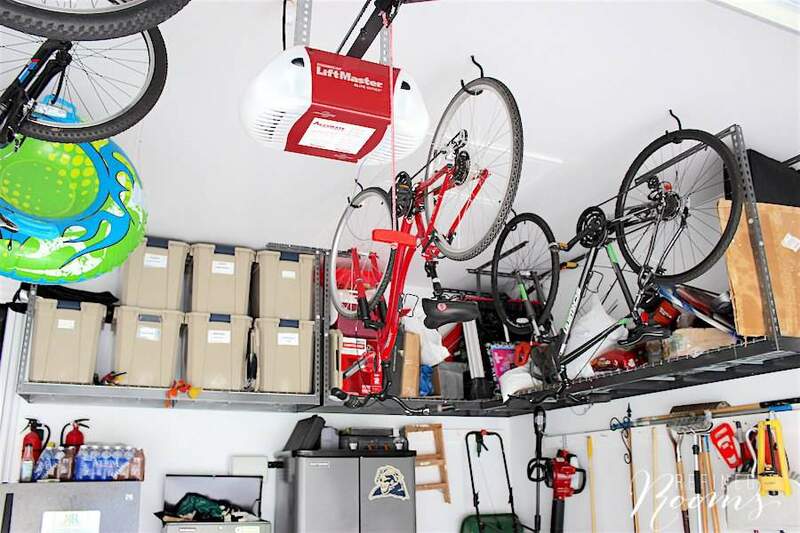 And you may want to take a peek at this list of no brainer items to declutter in the garage to give you a jumping off point. Before you begin, take a BEFORE wide angle shot photo of your garage. Pull every item out of the garage and sort each one into the appropriate category. Now turn around and look at that empty garage. Notice anything? It could probably use a good cleaning. Grab the broom (or leaf blower!) and sweep out the dirt and cobwebs from every nook and cranny. 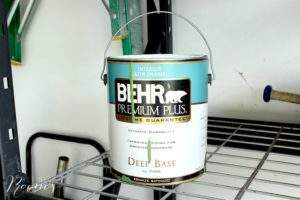 If bugs or critters are an issue where you live, it’s also a great time to to put down traps and/or spray insecticide around the perimeter of the garage. Don’t forget to remove the cobwebs that have gathered in the ceiling corners. I also like to take this opportunity to hose down the garage floor. Grab your camera, and snap a photo of your empty garage! When’s the last time you’ve seen it look like that? 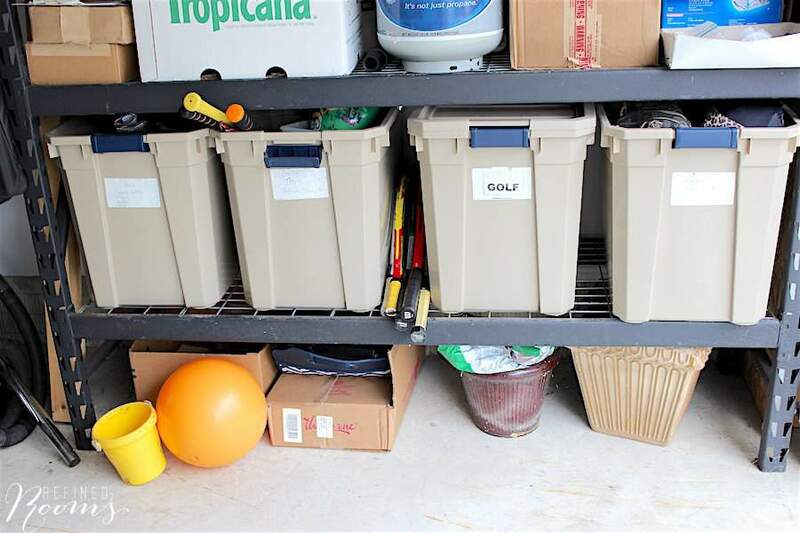 Now that you’ve completed your initial sort, remove the trash, relocate the items that don’t fall into any of your predetermined garage categories you established in the Evaluate step, and remove the Donate and Sell items. That leaves us with the Keep pile. Group like-items together into categories that will be stored together in a particular area of the garage to create a zone. Now’s the exciting part! It’s time to set up zones and put your items back in an organized manner. 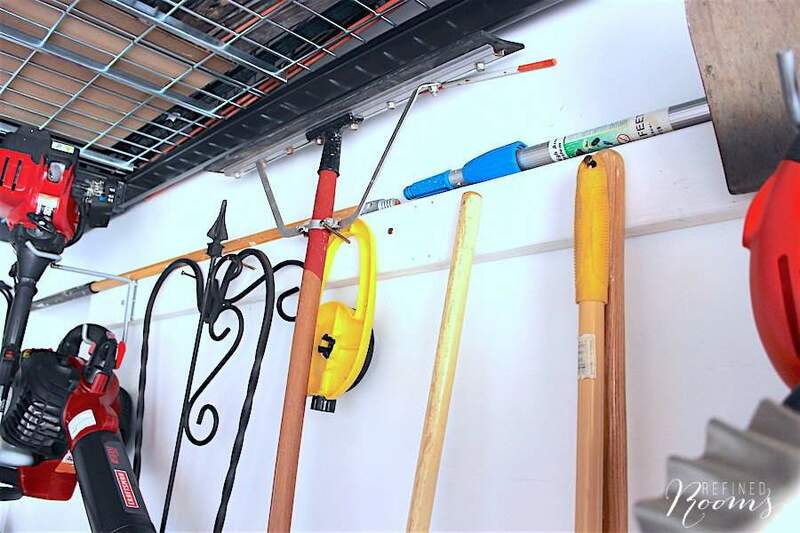 In the garage, your #1 goal is to keep the floor free and clear of items. The best ways to accomplish this are to use shelving, wall storage solutions, and ceiling storage solutions. 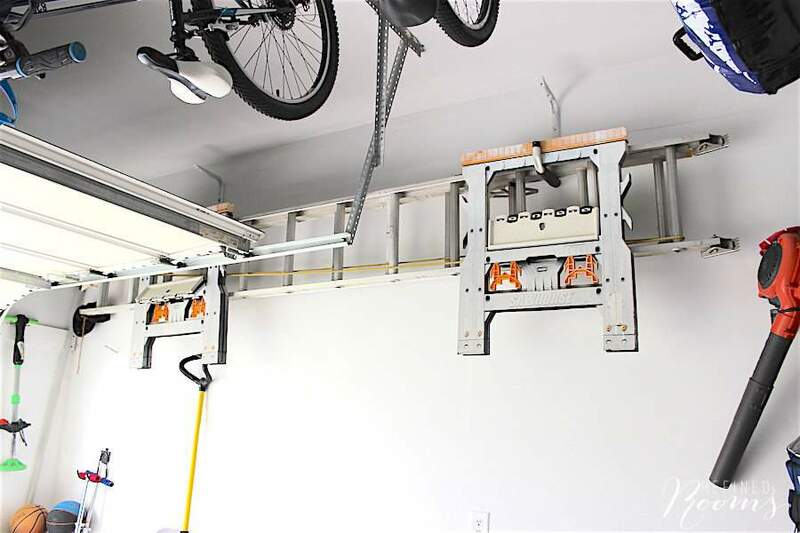 And by far, the best storage investment we ever made was when we installed a ceiling mounted steel storage system in the garage a few years back. It is A-mazing how much these shelves have paid us back in happiness each time we park our cars in the garage. For me, large plastic totes are where it’s at when it comes to containing the families of items that live in our garage. They do the best job of protecting items from the elements. I prefer totes with latching lids. 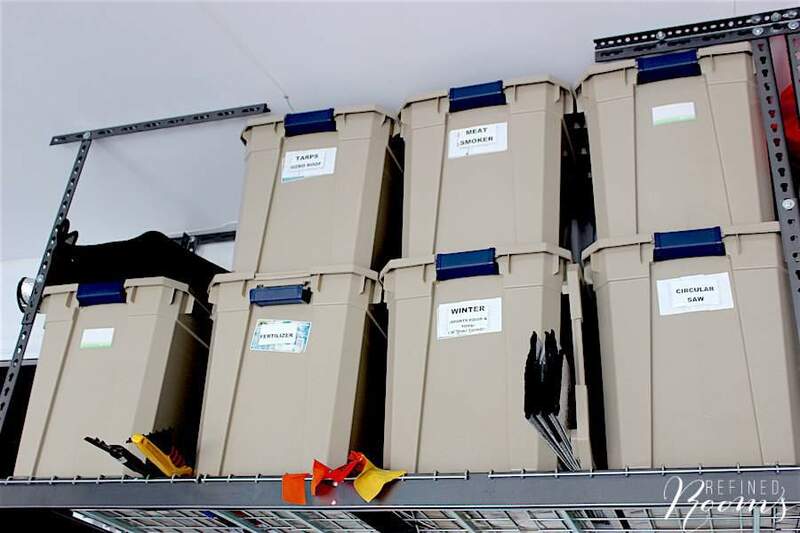 Of course, if you aren’t using clear containers, then you’ll need to label your totes to easily retrieve what you need when you need it. My favorite labels to use in the garage are Identa-Labels, which consist of a repositionable adhesive pouch, and an interior label. These babies really stand up to harsh climates, and they allow you to easily switch out the label, if need be. 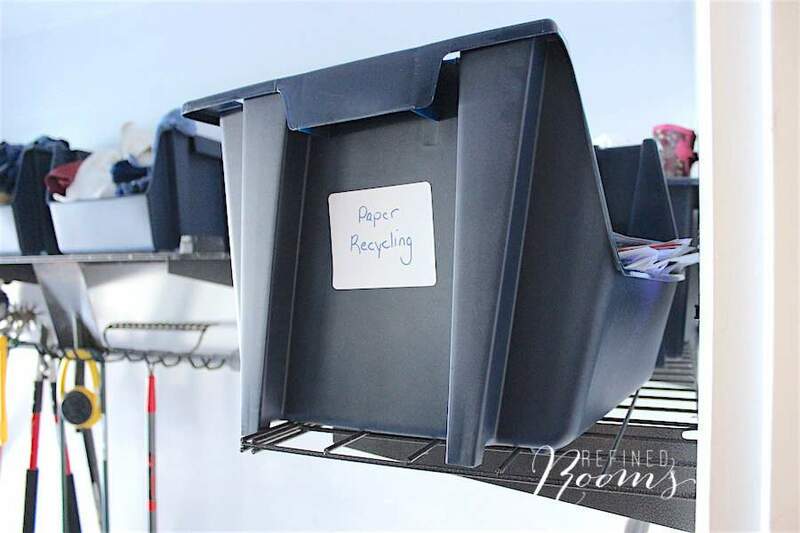 We store a paper recycling bin on the shelf directly adjacent to the stairs that lead into the house (below it on the floor is our plastic/can recycling bin in our recycling zone). This helps prevent junk mail from ever entering our house! Once you’ve put everything back into the garage, now pull that camera out and take your AFTER photo. Compare it to that BEFORE photo…what a great feeling! Plan to conduct a garage maintenance session in both late spring and late fall to keep this space in good shape. The beautiful thing about going through this process is that you should never have to take on this massive overhaul-type project again, IF you are religious about your maintenance sessions. During those sessions, be sure to declutter those random objects that have made their way in the garage but belong elsewhere in the house. It’s also the time to tweak things a bit, so that your organizing systems continue to match your family’s ever-evolving needs. For example, if your child is no longer playing with certain toys, it’s probably time to sell/donate those toys. If you’re storing camping equipment in the garage, but your family hasn’t gone on a camping trip in 10 years, it may be time to pass along those items to someone who can use them. After you’ve completed this month’s challenge assignment, share a Before/After photo collage of your garage on Instagram (use the hashtag #OrganizeandRefineChallenge and don’t forget to tag me) and/or share it in the Refined Rooms Facebook community. Better yet, send me a photo of your cars parked in your newly organized garage! I’m writing to let you know that your inspiring article will be featured at Funtastic Friday #77. The party opens tomorrow night at 9 pm EST. That’s great news! Thanks so much Sherry! 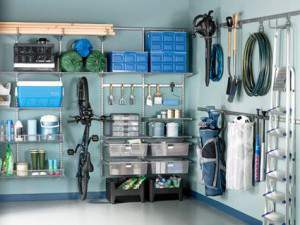 In my dreams, we have a garage and all of the best organizational tools to make it super easy to find everything and attractive to look at. Thanks for sharing with us at Merry Monday. Great post, Natalie. It interesting to me that people don’t think of hanging their seeder. My husband is pretty organized and that was one of the first things he hung in our shed. Our garage is pretty narrow so need to be pretty creative when storing stuff in there. 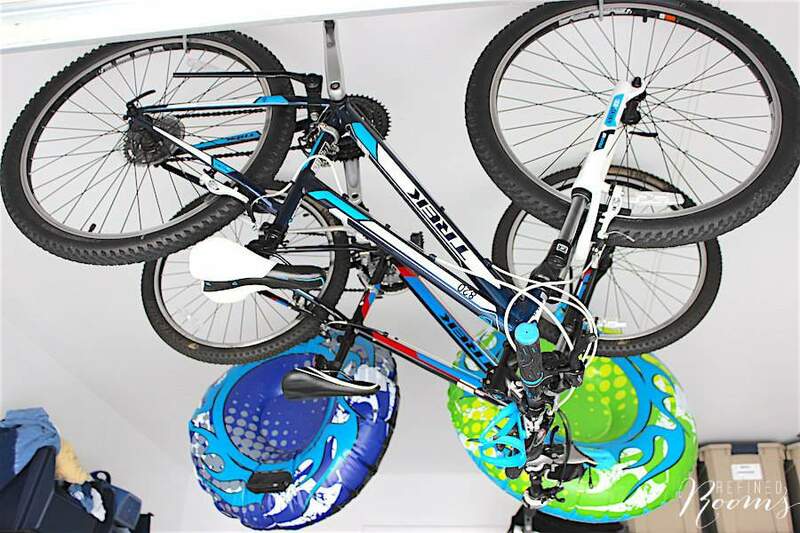 W can only store bikes and our family’s shoes on the walls with Ikea’s wall mounted shoe racks that is only 8 inches deep. In narrow garages, the only place to store anything is from the middle of the wall and up. And only ladders and folding tables can be placed on either side. Thanks for sharing the printable. Great points about the narrow, 1-car garage Sabrina! We don’t have many of those where I live, but I definitely know they pose more of a challenge when it comes to organizing (getting those items stored up high so you don’t bash your head on things as you exit the care is definitely important)!! This is not a small project, but well worth the effort. I love the Monkey Bars product. NAPO-CT is actually running a Garage Makeover contest, and they are donating a system to the winner. So exciting! That IS exciting! 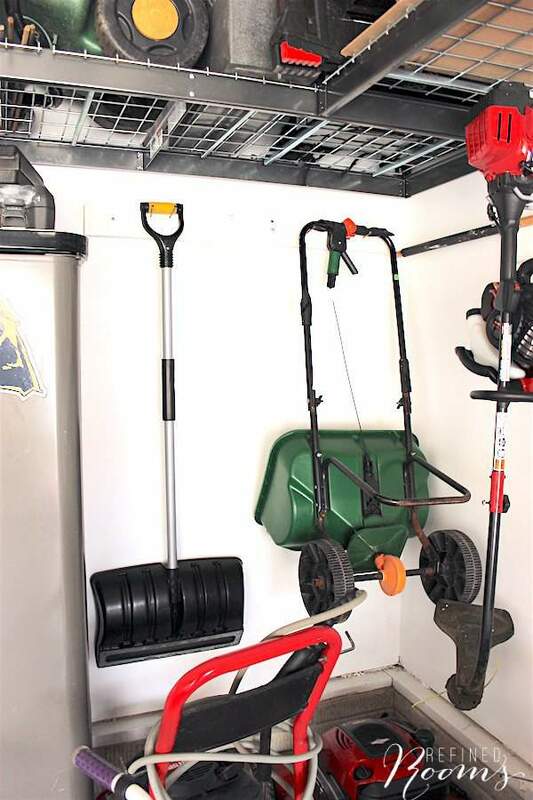 I absolutely love the Monkey Bars storage line and am actually planning on investing in additional products later this year to store our sports equipment. Yes, this IS NOT a small project Seana!